Heat pumps extract ‘low grade’ heat from the ground, air or water and concentrate it to heat the water in the central heating system (radiators and/or under floor heating) and the domestic hot water supply of homes and businesses. This heat is totally free and is renewed naturally by the sun. It is extracted either from the ground, water or outside air. Heat pumps use electricity to run, but this is significantly less than other forms of heating, and can represent an energy saving of up to 60%. Most heat pump systems are climate controlled, which means that they provide a constant level of heat to your home regardless of the outdoor temperature. Rather than providing intense heat for a short period, as with conventional fossil fuel boilers, they maintain a constant level of background heat. This provides a much more comfortable living environment. Heat pumps work a bit like a fridge in reverse. They consist of a closed circuit containing a refrigerant which is in gas or liquid form at different stages of the cycle. The liquid refrigerant passes over the evaporator, taking on heat from the air or ground, and evaporates to a gas. 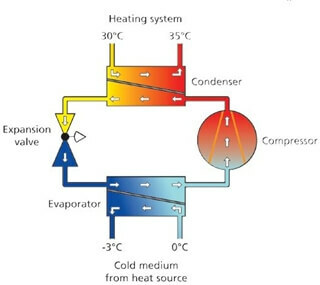 The compressor then returns this gas to a liquid and the heat energy is transferred to the central heating system. The refrigerant then passes through an expansion valve and returns to a gas to repeat the cycle. The efficiency of a heat pump is measured by it’s Coefficient of Performance (CoP), which is the amount of heat generated for each unit of electricity it uses. For example, a ground source heat pump would typically have a CoP of 4 – 5, meaning that for every unit of electricity it uses 4 – 5 units of heat are produced. Air source heat pumps have slightly lower CoP’s (typically 3 – 3.5). For comparison, a modern gas or oil fired boiler would produce around 0.95 units of heat per unit of fuel used. 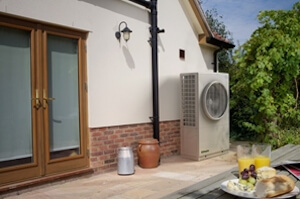 Heat pumps are generally more suited to modern, well insulated properties. Because they heat water to lower temperatures than a conventional boiler, they work particularly well with under floor heating. With a radiator system, you may need to use slightly larger radiators than normal to achieve the same level of heating. Ground Source Heat Pumps are the most efficient, with CoP’s of up to 5, but they need more space for collector loops and have a higher initial capital cost. Even in the UK, the outside air contains enough heat for air source heat pumps to work efficiently all year round. They can extract heat from the air down to -15°C. 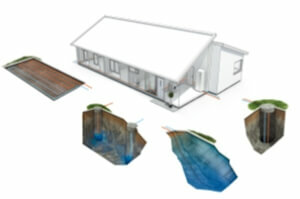 Do heat pumps need planning permission? Generally speaking, ground source heat pumps and smaller air source heat pumps are “permitted developments” and do not need planning consent. Air source heat pumps must comply with various restrictions on noise, distance from neighbours, etc. Fervo can advise you on this. Which is the right heat pump for my property? This will depend on the size of the property, the amount of land available, and your budget. Fervo are happy to advise on the best solution for your individual project. We are not tied to any particular manufacturer or model of heat pump and will give you independent unbiased advice. Give us a call to talk to us, or arrange a free, no obligation site survey of your property. To find out more about Heat Pumps – Call Fervo Renewable Energy on 0333 240 2121 or make an enquiry.